Should I stop riding when pregnant? Thousands of pregnant women are either uncertain if they might keep on riding or they tend to stop too soon. Regular Full Sus contributor and mom to her recent second child explains what she went through. + First check with your doctor (please note every doctor is different and you might have a conservative doctor who won’t be happy about you riding – you can always get a second opinion). + Listen to your body (if you feel fine it’s probably good for you and your baby but stop pushing yourself too much if you feel dizzy or too tired or uncomfortable). + Don’t ride in the heat to avoid overheating. + Don’t ride on busy roads to avoid a car hitting you. + Don’t ride too gnarly trails. (this is not the time to improve your skills – it can wait until your baby is born). + Be kind to yourself when you are coming back on your bike (don’t expect miracles, your body takes strain after giving birth, sleepless nights and breastfeeding. Start with shorter workouts and build it up). + Drink lots of water if you are breastfeeding. + Exercise, even vigorously, doesn’t influence your milk supply but make sure to eat and again drink enough water. 8 months pregnant and Kate still rode her mountain bike. Q: Is this your 1st child and how did it affect your training? This is my second child Eva. My first-born Mari is three years old now. I have cycled during both pregnancies. Q: What type of riding do you normally do and how did you change your approach whilst being pregnant? I love mountain biking but because of little time and safety these days I also ride on the road or indoor on a wattbike. With my first pregnancy I rode off-road till about six months pregnant and then I moved onto a wattbike. With my second pregnancy I rode bit longer on ther road on a mountain bike – till about eight months. Q: Where there any specific things you tried to avoid whilst being pregnant and riding? I didn’t ride any too dangerous trails even though I still rode some gnarly trails in the first and second trimester. I watched out not to ride in the heat in summer to prevent the baby from overheating. That is quite important! And also, to hydrate enough. I ran till about eight months pregnant with my first one and till 6,5 months with my second pregnancy. I felt like my pelvic floor and deep core muscles were taking too much strain with running with the second pregnancy, even though I did core training. I listened to my body and stopped running as it didn’t feel good afterwards. 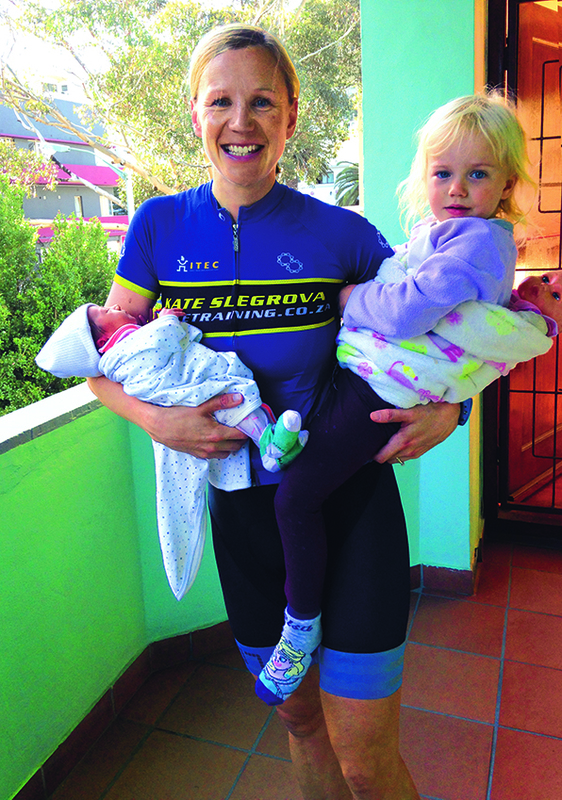 Q: What was the most difficult aspect of getting back on the bike post birth? I was lucky to have a pretty smooth natural birth and small baby so coming back to exercise and bike was fast and fairly easy. I am breastfeeding though so that limits the duration of exercise. I usually only ride for an hour or 1,5 hours. I have started doing first gentle strength training exercises one week after birth. But I wouldn’t recommend doing heavy weight training too early because of hormone relaxing that could cause injury. Q: Did you lose some of your fitness and how did you manage to regain some? I am sure I lost some fitness and endurance, but I must admit I was quite surprised when I hit some PRs and QOM quite soon after giving birth. So, it definitely pays off to keep fit during pregnancy. One mustn’t think though that you will get fitter during pregnancy. It’s more about maintaining fitness and staying healthy while keeping your baby inside happy and safe! Q: How far along was your pregnancy before you weren’t allowed to ride? I rode on the wattbike till the day before I gave birth with both pregnancies as I had no complications. My doctor knew about that and was happy and supportive about my exercise routine. The exercise gave me energy and it also helps with maintaining a bit of fitness and not putting on too much extra weight. I had a varicose vein on my thigh and if I didn’t exercise it was sore. Varicose veins are common in pregnancy and exercise can prevent getting them or making them worse. Q: How long after birth where you allowed to ride again? With my first child Mari I started riding after 10 days as I had a natural birth without complications and with my second daughter Eva I was on bike even earlier. That might seem too early to some, but I felt fine and ready to start. I started with gentler short ride (40 mins) and worked out to hilly rides, but short (around an hour). Q: What is the biggest misconception about riding while being pregnant? I think some people are scared of falling. I wouldn’t recommend to beginners to start riding while pregnant. The expecting mum needs to have good balance and skills beforehand. Doctors always say don’t start with anything new. So, if you were riding 12 hours a week why should you stop? Another thing is that you have to take it really easy and keep your heart rate down. I have continued with high intensity workouts till the end of my pregnancy and I felt fine. Q: If baby Eva is grown up, will you encourage her to ride a bike? Definitely but I won’t force my daughters to ride. My firstborn Mari is already riding on a pedal bike after mastering a balance bike. She’s enjoying it a lot. Q: What makes riding a bike so special to you? back from a ride I’m a happy relaxed mum and wife. One week post birth with her daughters Eva & Mari. Dr Martin Puzey is a gynaecologist in Cape Town and Kate’s doctor. + How far along during a pregnancy can a patient still ride/run or be active? There is no such thing as bad exercise in pregnancy and a pregnant cyclist can continue activity right up until she has the confinement. + What are the benefits of staying active during pregnancy? The main benefit of cycling in pregnancy would be to maintain the woman’s general health and wellbeing. If the mother is healthy, the foetus will obviously benefit. + What are the biggest concerns with training while being pregnant? The main problem with regard to training during pregnancy is the difficulty of some of the mountain bike trails. These can be extremely arduous and technically difficult. A pregnant woman has a higher body mass index and is therefore more vulnerable to injury and falling. The main concern would be maternal injury rather than foetal injury. I would suggest that technical trails should be avoided and that a more cardio endurance type exercise would be preferable. The maternal heart rate over 150 is often seen as a cut-off for cycling in general. I don’t think there is conclusive scientific evidence to support this, however as a general rule, it is useful. + Generally, how long should a patient wait after giving birth before she could return to riding? As soon as the patient is comfortable she can resume cycling again. This will help her recovery and state of mind and in general this is two to four weeks after delivery. + Any advice specifically to cycling mothers-to-be? Listen to your body. If you feel you are over-exercising, then one should be cautious. Physiologically a pregnant woman has double the blood volume and an extra unit of red blood cells and therefore is able to theoretically be far more efficient in long distance sports, almost like having an EPO injection! Unfortunately, this is counteracted by high progesterone hormone that causes fatigue!